Basically Vickers hardness is similar as Brinell hardness because an indentation is made beneath a load P and the Vickers hardness number is explained as the ratio of load P to the surface area of the indentation. The between two test techniques difference lies in employ of indenter. The Vickers indenter is a diamond pyramid along with square base and integrated angle between opposite faces as 136o. The impression of such indenter has square boundary along with depression in there. The lengths of two diagonals are measured beneath microscope and average is employed to calculate the surface region of indentation. Here, P is the indenting load in kgf. 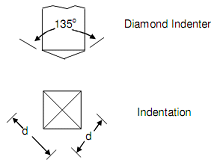 θ is the angle between opposite faces of diamond come that is 136o. The impression of the diamond cone is square beneath any load; thus the impressions are geometrically the same irrespective of load. This offers a great convenience of a carries on scale from extremely soft material to extremely hard material with no varying the load or indenter. Usually for specified load hardness from 5 to 1500 VHN can be measured through Vickers indenter, and it creates VHN independent of load except at extremely high loads. Though, loads between 1 kgf to 120 kgf are normally employed for VHN measurement for exceptionally soft to exceptionally hard metals. For the purpose of independence of VHN of load, such method has extensively been accepted like a research tool. Vickers hardness measurement however, cannot be made on poorly finished surfaces and an element of personal fault is introduced due to accurate measurement of the diagonal of indentation. Additionally, the "anomalies of ridging" in condition of cold worked metals and of "sinking in" in condition of annealed metals are also seemed in Vicker's impression like in case of Brinell indentation. The barrel shape of indentation reasons an apparent raise in hardness because of "ridging". Pin-cushin shape of indentation reasons an apparent reduce in VHN because of sinking in as present in following figure through perfect Vickers indentation.